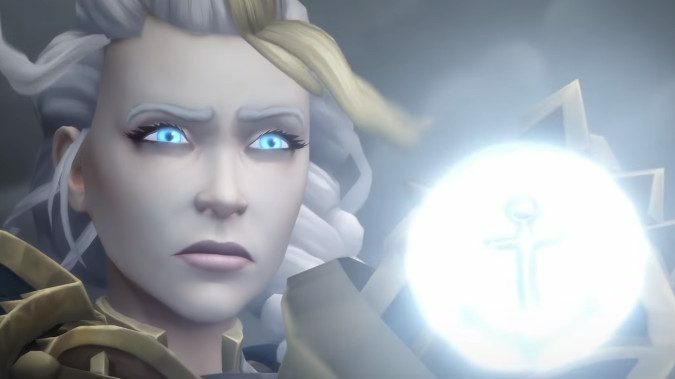 The folks at Wowhead have their usual quality overview of the upcoming Jaina Proudmoore fight in Battle of Dazar’alor, and I have to say that Jaina is a complex, fascinating multi-phase fight. Not only does she manage to take on a host of the Horde’s greatest champions as well as a Zandalar fleet and Nathanos Blightcaller, but she also manages to toss a wrench into one of the game’s longest DPS-boosting mechanics. When your raid casts Heroism or Bloodlust, Jaina will immediately Ice Block — using up a solid 20 seconds of DPS time while she sits immune to all damage in a chunk of ice. Even for a raid on Dazar’alor, that’s some serious trolling. Of course that’s not all there is to the fight. It’s a three-phase fight with not one, but two intermissions. Intermissions are to this fight what Jormungars were to Trial of the Crusader. The fight talks with the usual smack talk between Jaina and Captain Zadari, who’s a trifle miffed that the Alliance attacked Dazar’alor and, well, all that unpleasantness. From there, the fight stays on the Horde ship until phase one ends, wherein Jaina triggers a cut scene and the fight shifts to a conjured ice floe in the middle of the sea with a host of terrifying frozen mechanics to deal with. Jaina will be stacking Chilling Touch on the raid, freezing anyone who gets 20 stacks and drops below 80% health in an ice block that needs to be killed. It’s much like when Sindragosa would freeze several members of the raid back in ICC — you have to break any Ice Blocks that happen to free your fellow players in time. Meanwhile, you’re being shelled by Jaina’s Kul Tiran fleet, which actually provides you with heat sources to take the Chilling Touch debuff off to help you keep from getting frozen in the first place. There’s still another phase where things get even harder — the complete write up on Wowhead goes into details, but just know this isn’t going to be an easy fight. And yes, Jaina escapes at 5% health, but considering she was primarily covering a retreat, this is one of those fights nobody really gets to feel great about. Still, Horde players get a title, Hero of Dazar’alor, for defeating Jaina on Mythic difficulty and there’s a Water/Ice Elemental mount, the Glacial Tidestorm, in case you needed more incentive. We’ll get to see the raid for ourselves soon but I can’t wait to see Jaina Ice Block during Bloodlust for myself — I suspect for a lot of players it will come as a very nasty surprise. But there’s a potential silver lining here — a savvy raid leader could well use the Ice Block to force Jaina to stop attacking and give their raid group a break from her punishing ice assault, essentially trading 20 seconds of being unable to damage the boss to allow their healers to catch up, or their DPS to switch to breaking their own players out of Ice Blocks themselves. So we’ll see what the community comes up with once we’re in the thick of it.